This refreshing relish is packed with punchy flavours and is great scooped onto mini poppadums. No cooking required! Cut the cucumber in half lengthways. Using a teaspoon, scrape out and discard the seeds from the centre. Grate the cucumber coarsely and place in a bowl. 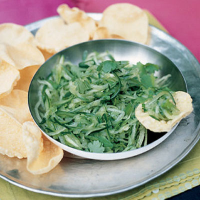 Mix the chilli and coriander with the cucumber, then add the lime juice and season to taste. To serve, spoon the relish onto a plate with some mini poppadums. Make the relish in advance and keep chilled until required.